Digital signage systems make use of display screens, media players, content management systems, player software, mounting accessories, cables, and power supply to display dynamic or static visual content in indoor or outdoor environment for the purpose of information display, advertising, or promotion of products and services. According to 6Wresearch, India digital signage market is projected to reach $874 million by 2022. Although, India's digital signage market is yet to develop on larger scale owing to low degree of awareness in semi-urban and rural parts of the country. Increasing public infrastructure development activities is leading to increasing penetration of digital signage systems across the country. Within digital signage systems market in India, display screens segment accounted for majority of the market share, followed by content player and software. Amongst all verticals, retail, entertainment, government & transportation and hospitality verticals have captured majority of the revenue share in overall India's digital signage market. In-terms of regions, Western region captured the largest share of the market followed by North, South and East. The key players in the market include Samsung, LG, Panasonic, Sony, Xtreme-Media, Nusyn Digital (Formerly Scala), Vyoma, LiveMedia, and others. 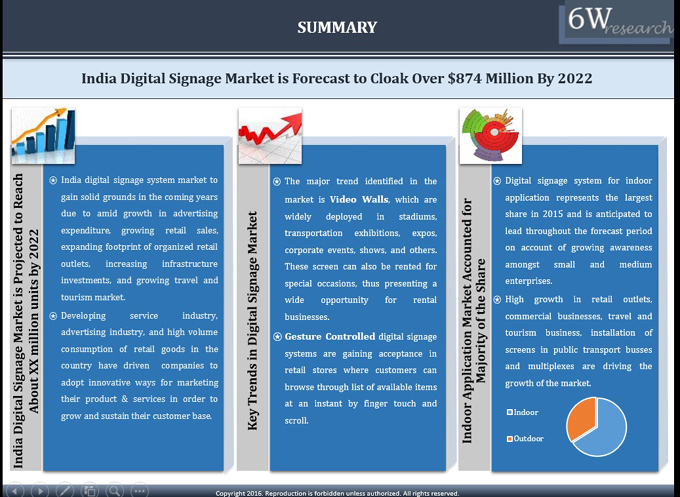 The report thoroughly covers India digital signage market by components, display screen types, display screen technologies, display screen size, content media players, software, verticals, applications, regions, and competitive landscape. The report provides an unbiased and detailed analysis of the on-going trends, opportunities/ high growth areas, market drivers which would help the stakeholders to decide and align their market strategies according to the current and future market dynamics. 13.1	Samsung India Electronics Pvt. Ltd.
13.2	Panasonic India Pvt. Ltd.
13.3	LG Electronics India Pvt. Ltd.
13.4	Sony India Pvt. Ltd.
13.5	BenQ India Pvt. Ltd.
13.8	Xtreme Media Pvt. Ltd.
13.9	Nusyn Digital Solutions Pvt. Ltd.
13.10	Vyoma Technologies Pvt. Ltd.
13.11	OOH Media Solutions Pvt. Ltd.